Participants pulling a handcart in central Wyoming. In the mid 1800s, nearly 70,000 members of the Church of Jesus Christ of Latter-day Saints traveled across the plains from Nebraska and Iowa to the Salt Lake Valley. Most were in wagon trains, but ten companies of pioneers (totaling around 3,000 persons) pushed handcarts containing all of their possessions for more than 1,000 miles. This month nearly 200 youths and 75 accompanying adults from Berthoud, Loveland, Windsor, and Fort Collins– all in pioneer attire, re-created part of that pioneer journey – pushing handcarts for a total of 36 miles in three days! The trek was organized under direction of J. Steven Garrett, President of the Loveland Colorado Stake of the Church, which comprises ten wards (congregations) in Northern Colorado. Marilee and Robert Powell, of Loveland, coordinated the entire event. The participants traveled to central Wyoming July14, camping out for three nights with various discussions of the pioneer effort, including time for singing, square dancing, and learning more about themselves, as the physical hardships were manifest. Sites of the trek re-creation are historically important, as two of the actual handcart companies faced incredible hardships in Wyoming in October of 1856 when severe snowstorms devastated the travelers. 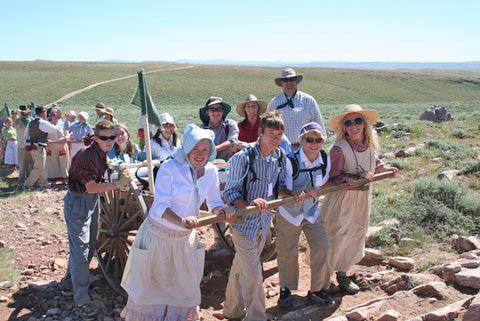 Some of the Colorado participants in this month’s trek are descendents of persons in those ill-fated handcart companies. 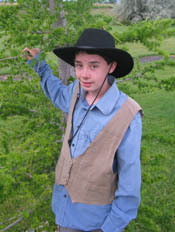 Marilee Powell reported, “We organized all of the participants into ‘family’ groups (each having a “Ma and Pa”) so that they could have a feeling of support required of the early pioneers. ” Each youth was given the name of an actual traveler inn the early handcart experience, some learning along the route that the person whose name they were given actually died during the devastating storm. The original travelers were finally rescued by pioneer teams sent from Salt Lake City. The name Natalie Hawkins was given from the original pioneer party was a 31-year-old woman who lived for six years following the handcart experience. Preston Ross had the name Benjamin Platte, a 23-year-old who survived the original journey in 1856. 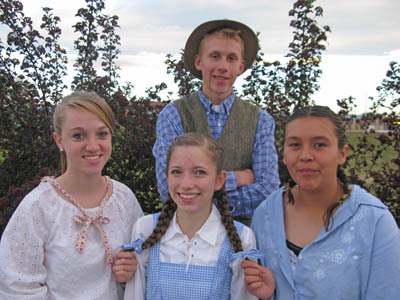 Re-creating the pioneer experience is referred to as the “Trek, ” and has become a tradition in the Loveland Stake, provided once every four years, so that youth from 14 through 17 can participate in the experience at least once while part of the Church of Jesus Christ of Latter-day Saints youth program. Some Wyoming sites of the handcart journey are open to the public, including a visitor’s center at Martin’s Cove, 55 miles southwest of Casper. Site contents copyright © 2019 Recorder Online	except as noted. All rights reserved. | 98 queries in 2.190 seconds.